A lulu LEMON of a Stock? Trendy retailer lululemon came out with an initial public offering on Friday. (See lululemon athletica inc. LLL on Toronto). Those who were lucky enough to grab some at the over-subscribed IPO price were rewarded as the U.S. $18 (about CAN $19) stock popped to CAN $29.72 on its first day of trading. This was great for any investor who bought at the IPO and sold for a quick profit of over 50%. It was also great for the company which raised about CAN $43 million from the sale of 2.3 million shares by the company. It was even greater for current insiders of lululemon who received, and will walk away with, about CAN $300 million. But, it seems clear that this is a grossly over-valued stock. Anyone now holding these shares is almost certain to lose money. lululemon is probably a fine company. I have nothing bad to say about it as a store or as a business. But as a stock it is grossly over-priced. 15.9 million of the shares sold to the suckers (er I mean to the public) were sold by the existing shareholders who netted a booty of about U.S. 286 million. That’s right, these insiders were selling and have netted about CAN $300 million. That is a major red flag right there. Ideally in an IPO insiders reluctantly allow in outside investors in order for the company to raise money and grow. That’s not the case here. Here the company gets not that much of the cash and insiders are free to run off with huge bags of money. Page 43 of the final prospectus reveals that the U.S. $18 shares have a book value of $1.02. This means that these shares are now trading at a staggering 29 times book value. IPO investors have suffered a book value dilution of a staggering 94%. Last year the company earned 12 cents per share (see page 46 of the final prospectus). This translates to a P/E ratio of a staggering 248 times! Last year lululemon had sales of $149 million. The market is valuing this company at 13 times sales (sales not profit). There can be little doubt that this will end very badly for the new shareholders. Right now it has 59 stores. A July 2006 press release indicates that the sore had over 40 locations at that time. Therefore I estimate that it had about 40 stores open during 2006 (over 33 at the start of 2006, 53 locations on Feb 12 2007, for an equivalent to at least 40 open all during 2006). Assuming it had the equivalent of 40 stores open for all 12 months of 2006 then sales were about $3.7 million per store or $10,000 per store per day. These are not large stores. One press release discussed an 1100 square foot store. The company now has 67.5 million shares outstanding and the market values this at $2.0 billion. The company has 59 stores. This places a value of $34 million on each store. Think about this folks. Would you pay $34 million for a small retail store? Remember, I estimated above that sales were about $3.7 million per store in 2006. No-doubt, $3.7 million per year in sales is excellent for a small store. But it can not come anywhere close to justifying a price of $34 million per store. Sure, lululemon can grow and no doubt its earnings per share will rise. But $2 billion is a staggering amount of money. This is as bad as many of the dot-com fiasco’s of the late 90’s and early 2000’s. I am tempted to look into shorting this stock. However, there is always a risk that irrational investors will continue to push the stock price up. I consider short-selling to be highly risky at all times and something that is best left to professional traders. The bottom line for me is that this IPO was so grossly over-priced that everyone associated with it should be ashamed. The above is a also a useful illustration of fundamental analysis. At its most basic it is not that complex. Basically fundamental analysis looks for stocks that seem to be under-valued based on a rational analysis of their earnings and other factors. The idea is to buy relatively under-valued stocks and sell or avoid over-valued stocks. No doubt you are familiar with cases where the same product or service is sold at vastly different prices. A classic example is an airline seat. A full fare economy class ticket that normally costs $1000, might only cost $300 if booked far in advance. Or it might be sold on a last-minute sale basis for $100. Seats are sold to group tour operators at deep discounts. Then there are first class tickets. You could easily pay $1000 extra for a bit more room, as well as a meal and complimentary drinks. Another classic example is senior’s discounts on various products. In general companies do not offer discounts as a “favor” to customers. They do it as a way to grow their business and profits. It seems to me that price differentiation is becoming more and more common. And the spread between the lowest and highest prices for the same product can be astonishingly high. The plain fact is that some customers are willing and able to pay higher prices than others. In a perfectly competitive market, everyone tends to pay about the same price. In a perfectly competitive market a company is unable to charge different prices to different customers. Perhaps there are no perfectly competitive markets. But gasoline retailing tends to be extremely competitive. The way that the retail gasoline market has evolved it is difficult or impossible to charge different prices to different customers. We all tend to pay the same price for a given grade of gasoline in a given City. Such standardized pricing appeals to our sense of fairness but it does have its drawbacks. Rich people who would still buy gasoline if the price were doubled pay less than they are willing to pay. In effect the retailer is leaving money on the table. Some poor people simply don’t buy gasoline as it costs more than they are willing to pay. At its best, price discrimination can work for everyone. Richer people pay more but are perhaps rewarded by better (real or imagined) services or brand status. The seller can take some of the “excess” profits earned from the rich people and use this to subsidize the poorer customers as long as the poor customers at least pay the sellers and, make some contribution to fixed costs. But the seller will not typically pass along all of the excess profits and will tend to make a higher profit than under a standardized pricing approach. I believe that today’s sellers are increasingly using strategies of highly differentiated prices. If you don’t mind paying higher prices for service or perceived brand factors then sellers will oblige. If you are price conscious then I believe that it is increasingly possible to save large amounts (compared to regular prices) by watching for sales, using coupons, shopping at brand-name discount outlets, and in dozens of other ways. Getting the best deals will typically cost you time and energy. It’s totally up to you to decide if bargain hunting is worth your time and energy. The Canadian dollar recently reached highs around 96.5 cents but has backed off slightly now to 94.0 cents. It’s difficult to predict if our dollar will keep rising. The high Canadian dollar has both positive and negative consequences. In my view the high Canadian dollar presents individual Canadians with certain golden opportunities. There is a golden opportunity for Canadians to transfer more of their investments or savings into U.S. dollars. It may be that our dollar will go even higher soon. But meanwhile we are close to parity with the U.S. dollar for the first time in over 30 years. Rather than getting cute and waiting for parity or better, I would suggest it is prudent to grab some U.S. dollars now while the price is basically lower than it has been in over 30 years. The cost of a vacation to the U.S. is now substantially lower with our higher dollar. You might want to take advantage. And you can do some shopping while you are there. For Canadians, there has not been a better opportunity for cross-border shopping in about 30 years. Are you thinking of buying a car? car prices in Canada have not adjusted for our higher dollar. Right now I believe that there is an absolutely golden opportunity to buy a car in the U.S. and save thousands. It is complicated however. You would want to make sure all applicable taxes and duties are paid and that any required emissions tests are done. Imagine a retiree who was thinking of moving to the U.S. permanently. Right now their savings are worth substantially more in U.S. dollars. This is a golden opportunity for people to sell their houses and take their investments and go live in the U.S. (assuming they can get the necessary work and/or residency permits and assuming they want to live in the U.S.). As for businesses, the huge rise in the Canadian dollar will have huge impacts on some businesses and little impact on others. Every business owner and manager should be giving thought to how to best react. It’s well know that the average age of Canadians has been rising. 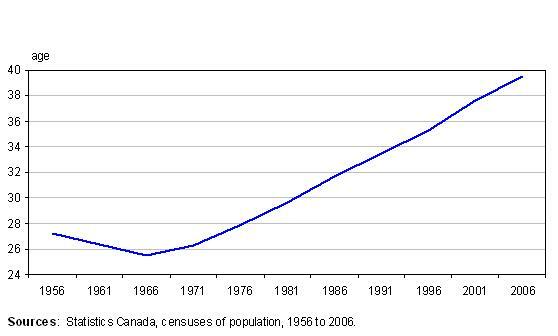 In fact the following chart shows that the median age of a Canadian has been jumping at a HUGE rate. In 2001 the median age of a Canadian was 37.6. In then jumped to 39.5 in 2006. If the trend continues then this will have a HUGE impact on business and society. Any business that caters to a certain age group should be studying demographics. One good thing about age ranges in the future, is that they are highly predictable. The number of Canadians who will be between 60 and 70 in 20 years is driven mostly by the number who are between 40 and 50 today. It also depends on death rates, which tend to be highly predicable. And it depends to a small extent on immigration and emigration, both of which are also fairly predictable. As I analyze different companies I will try to consider the impact of demographics. As one example, an aging population is likely to help and not hurt a company like Tim Hortons. Every business owner and marketing manager should be thinking ahead and keeping abreast of demographic changes and thinking about how to best react. But, if you are looking for stocks to invest in then why not subscribe now? The cost of $120 per year is well worth it if you consider that it might help you avoid investing in LEMON stocks. What you should be investing in is good companies at attractive prices, not good or even great companies at grossly inflated prices.